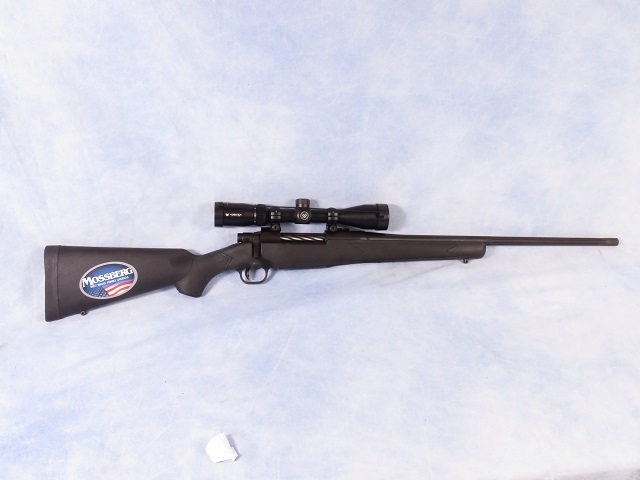 Mossberg Patriot bolt action rifle chambered in .30-06 Springfield with a 22 Inch Fluted Barrel, Matte Blue Finish, Black Synthetic Stock, 5 Round detachable magazine. Features include the Lightning Bolt Action adjustable trigger (2-7 pounds), Spiral-fluted bolts with new bolt angle and knurl pattern ensure smooth, comfortable and reliable cycling. Weaver-style base. 1:10 inch twist rate. Comes with Vortex Optics Crossfire II 3-9x40mm riflescope with a Dead-Hold BDC reticle and MOA turrets.